UPDATE: Over now, will announce winners in a.m.! If you missed out on getting a Target Beauty Bag, here’s another chance for one as I have 5 of them up for grabs. This cute little cosmetic bag contains 5 different Beauty samples and a Target Coupon Booklet with $19 in store coupons inside. 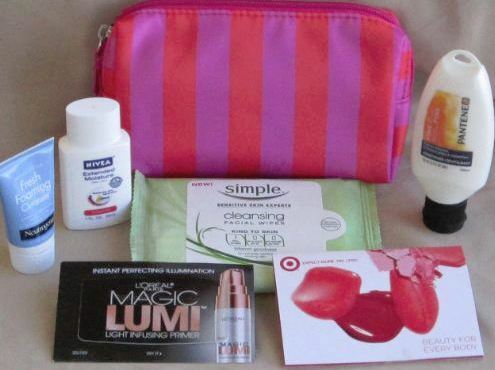 To make it even better, I have tucked in a few more bonus Target beauty coupons for even more savings in each bag! For this giveaway there will be FIVE winners and each winner will receive a Target beauty bag plus bonus Target beauty coupons. Love your site, thanks for the opportunity. I didn’t get this one, thanks Kerry. Love getting free samples! Thanks a bunch! Totally target!! Thanks for all you do! Love the sample sizes! Great for business trips. Would love to win the beuty bag! Cool! I’d love to win. Thanks! Win win win. Thank you. I would love to win one of the beauty bags! Cute makeup bag! Thanks for the chance of winning the freebie! I hope I win!!!! So Totally Target!!!!! Pick me!!! I would love to try some new stuff. And of course, coupons… You can never have too many of those. Love you site!thanks for a chance to win. my fingers crossed, thanks TARGET. I love this. Thanks for the chance. WIN WIN WIN. THANKS TARGET. Fun little giveaway. Didn’t get my hands on one the other day. You’re so nice, thanks for the chance! Being new to this site, this would be wonderful! would love one thx !